It was a warm and bright summer day when I departed from Ardrossan to cross the Firth of Clyde to Arran. Upon arrival at the port of Brodick, I headed for the remarkable monumental landscape of Machrie Moor on the western side of Arran. I had wanted to visit Machrie Moor for years, and I was not disappointed. The walk into this monumental landscape passes a succession of megalithic monuments, including the remains of a Neolithic chambered cairn. 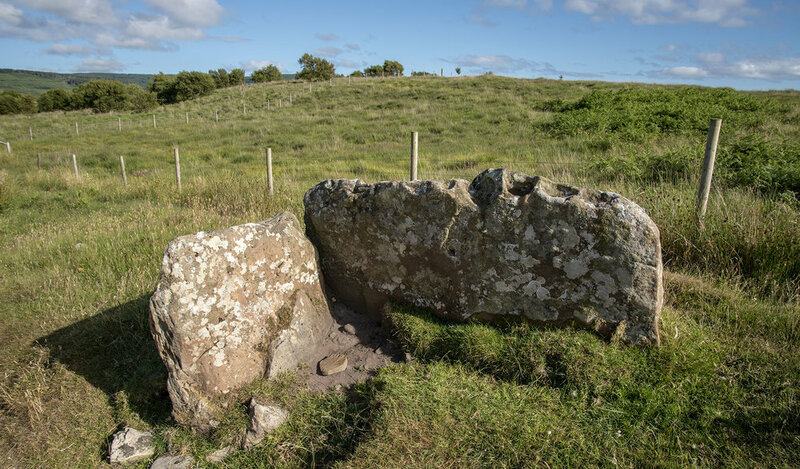 Machrie Moor Circles 2 and 11 were excavated in the 1980’s, revealed that both these monuments had earlier phases that were constructed using timber posts. It was shown that the contrasting stone shapes are not the result of weathering but an intentional part of the design. Some stones has even been sculpted by hand to refine their appearance. In the evening sunlight the sandstone monoliths appeared increasingly red. This emphasised one of the most striking feature of this gathering of monuments: their overt use of distinctive colours. This had to be deliberate, since the nearest source of the granite is over six kilometres (3 miles) distant. The sandstone was likely quarried from nearby outcrops. The aesthetic contrasts between these monuments is further emphasised by the contrasting experiences they offer. The tallest sandstone monoliths dominate the scene, and define spaces which would have had acoustic properties, since sound reflects clearly from their surfaces. In contrast, the shorter granite monoliths could not have been used in this way. I was pleased to note that the setting of the monuments on Machrie Moor fitted perfectly with the ideas I wrote about in my doctoral thesis almost twenty years ago. Stone circles often seem be placed within valleys in such as way that high ground surrounds the monument, reinforcing a sense of circularity and centrality.